NEW YORK (Reuters) - Stocks edged down and the dollar eased from a 14-year high on Wednesday, giving back some of the gains chalked up since Donald Trump's U.S. election victory as investors took profits on the rally in risk assets over the past six weeks. 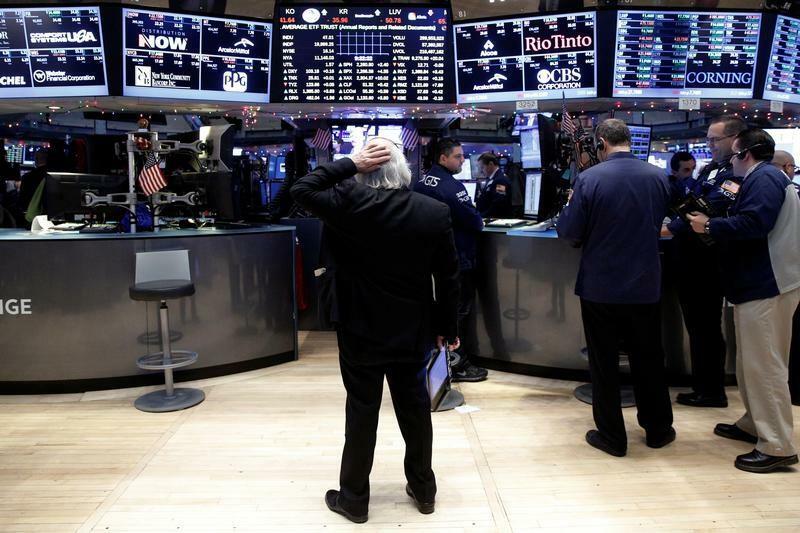 Wall Street was modestly lower with healthcare and real estate shares losing ground a day after the Nasdaq Composite and the Dow Jones Industrial Average hit record highs. The Dow remained just below the 20,000 threshold. U.S. stocks have surged since the Nov. 8 election. The Dow has jumped 9 percent and the S&P 500 has gained 6 percent, with traders betting that President-elect Trump and a Republican-controlled Congress will embark on steep tax cuts and fiscal spending to stimulate the economy. "People are taking a pause and they want to see what's going to happen," said Chris Zaccarelli, Chief Investment Officer for Cornerstone Financial Partners. "In his first 100 days in office, it will be interesting to see what legislation they can get through Congress and what regulations they will repeal." The Dow Jones Industrial Average (.DJI) closed 32.66 points, or 0.16 percent, lower at 19,941.96, the S&P 500 (.SPX) lost 5.58 points, or 0.25 percent, to 2,265.18 and the Nasdaq Composite (.IXIC) dropped 12.51 points, or 0.23 percent, to 5,471.43. The dollar index (.DXY), which tracks the greenback against six other major currencies, fell 0.3 percent, retreating after hitting its highest since December 2002 on Tuesday. U.S. 10-year Treasury note yields, which reached their highest in more than two years last week after the Federal Reserve raised interest rates and forecast more hikes in 2017 than most investors had expected, edged lower in light trading volume to 2.54 percent . Some traders likely reduced their dollar holdings on profit-taking ahead of a big batch of U.S. economic data on Thursday and the Christmas holiday, analysts said. "There are no big fundamental underpinnings to the move. It's more a technical adjustment ahead of the holidays," said Paresh Upadhyaya, director of currency strategy at Pioneer Investments in Boston. The euro, which touched a 14-year low on Tuesday, rose 0.4 percent to $1.0424 (EUR=) while the yen (JPY=) gained 0.25 percent to 117.55 per dollar. The Swedish crown (SEK=) rose 1.4 percent against the dollar, its biggest one-day gain in six months, to 9.21 crowns after the Riksbank narrowly voted to add to its bond-buying program. Chinese stocks rebounded as fears of a liquidity squeeze in the banking system subsided after risks from a bond scandal appeared contained, and on a pledge to deepen reforms in state-owned sectors. The blue-chip CSI300 index <.CSI300> rose 0.91 percent, to 3,339.54 points, while the Shanghai Composite Index (.SSEC) gained 1.15 percent to 3,138.54, both snapping a two-session losing streak. Tokyo's Nikkei share average (.N225) fell, pulling back from earlier one-year highs to close down 0.3 percent. The gains in some Asian bourses counterbalanced losses in the U.S. and Europe to leave MSCI's measure of global equity markets <.MIWD00000PUS> little moved on the day. Brent (LCOc1) and U.S. WTI crude both fell by around 1.5 percent.